SIIG's USB 3.0 to SATA Hard Drive with SD Reader Enclosure - 2.5" allows you to add a 2.5" SATA HDD/SSD to your computer through a single USB connection. It instantly increases up to 4TB storage capacity to your system, delivers SuperSpeed data transfer rate of up to 5Gb/s and supports USB Attached SCSI Protocol (UASP) to improve reading and writing speed for optimal performance. It is also integrated with SD/MicroSD memory card slots to support various storage media, allowing convenient data transfer between computer and mobile devices such as tablet, smartphone, camera, music player and more. This USB 3.0 all-in-one SATA Hard Drive with SD Reader Enclosure is an excellent mobile storage solution to improve storage capacity, support multiple SD/Micro-SD storage media and increase productivity. 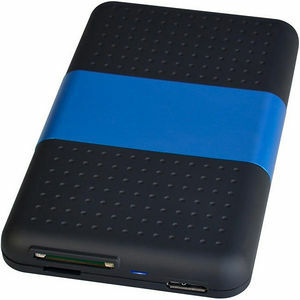 USB 3.0 to SATA Hard Drive with SD Reader Enclosure - 2.5"